Since last we met it seems TIGS has popped its ugly head into Scamp's Global Top 25 Ad blogs list [at number 25], which is delightful, and has moved into the number 4 position on the Misentropy Global Planning blogs list, which is also delightful. The lists are great ways to find some nice people saying useful stuff about advertising and that, so you should go and have a look if you like that sort of thing. 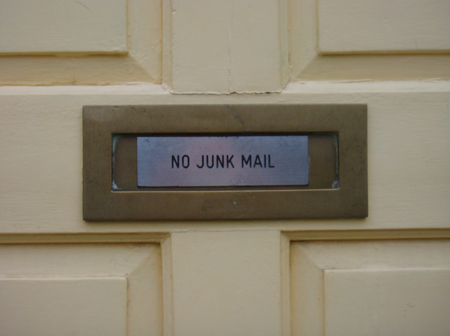 And then just today [ish] Neil has nominated the post I wrote about spreadable media as one of his posts of the month [which feels a bit cheeky since I stole the idea but, well, you know] - you can nominate others and vote and that on Only Dead Fish. So that's quite a lot of blog love during a period of silent blogging. So tomorrow I'll post something chunky to make up for it, and to pay my dues to Henry Jenkins, from whom I stole the spreadable media post. I was down in South Africa last week, speaking at a conference called Brands in the Digital World. It was great fun and I got to ride an elephant [not at the conference]. I met some really interesting people down there. Mike spoke passionately about blogging. Patrick pulled out some really interesting thoughts about virtual worlds. Allan - who is creative head at Saatchi's AtPlay interactive division [anyone know if it exists anywhere else? Seems really cool - proper creative technologists - although I can't find their website] - spoke about how to get people involved and what viral really is. And Eric tried to explain the dark arts of search. It made me realise how Americentric [there must be a better way to say that but I can't work out what it is] the English speaking blogosphere is. South Africa even has its own version of technorati, Afrigator, to help redress the balance. I wonder what will happen when the English is no longer the primary language online and the world refocuses on Asia. Actually, the above link is much more important than a footnote. Once virtual worlds stop being game environments and become feasible ways to manipulate data, transact and deliver telepresence for businesses, it will change everything. I was having a little wander around the plannersphere and noticed that lots and lots of blogs in my strands list over there to the right have gone quiet sometime over the summer. I was starting to feel a little lonely, but then fortunately Beeker came back, which was nice. 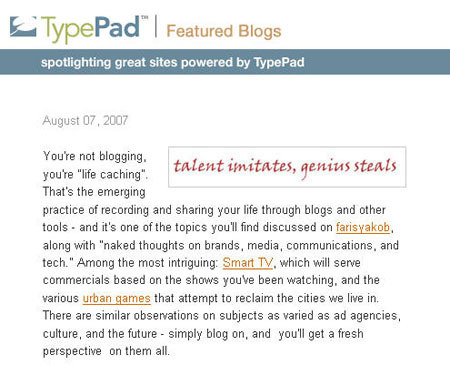 Well, this is very nice - it seems that TIGS is today's featured blog on the Typepad homepage. Thanks Typepad! Check out the featured blog for inspiration outside the Sphere. Hello! I've been nominated for Post of the Month for February for a piece I wrote about Pseudo-Modern Communication, which is lovely. We can offer people the sense [or illusion] that they are in control of their interaction with the brand and that their interaction is a requisite condition for its existence. Because they are and it is. This is quite neat since the Post of the Month idea is also a pseudo-modern text and it requires your input. So please go and become part of it here and vote with your finger. 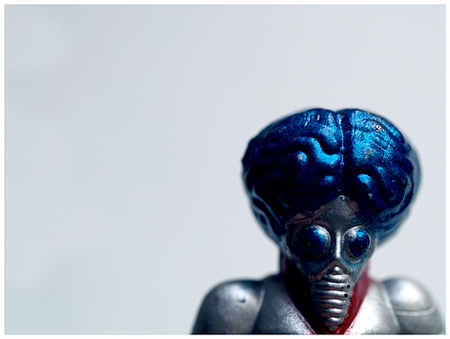 Scamp has revived the Top Ad Blogs list that Beyond Madison Avenue used to do. I sneak in at number 10 on the UK list, which is neat. At least until Paul becomes a planner and knocks me off the bottom. 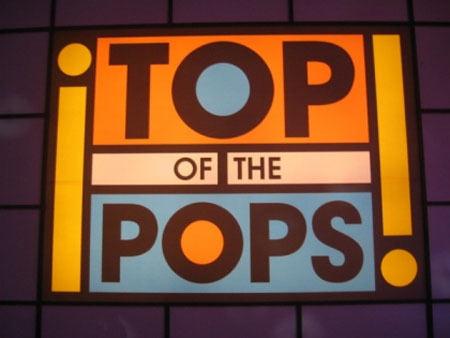 Do you remember when Nirvana were on Top of the Pops and they refused to mime properly? That was awesome. You can watch it here and recapture, for a brief moment, the awkward, glorious rebelliousness you felt when you used to Smell like Teen Spirit.